We checked in on May 15 and had reserved a pull through, level site, that would accommodate a picnic table and a 27 foot RV. Upon check-in we were taken to site number 69 which was not a level site, had difficulty accommodating a 27 foot airstream trailer in terms of its intersection and provided less than 6 feet from the front doorsteps to a 2 foot drop down with the site below. My wife has multiple sclerosis and I am a 90% disabled veteran. Upon seeing the site we indicated that we needed something better, something wider and something that was more level and was told that they would look into it and get back to us. We heard nothing on day one as the office closed. We again, requested a different site and again was told that they would look into it. Upon our arrival we had medical issues and the site they provided us had an almost 35% grade to walk up and down to get into any of the facilities and we indicated that was unacceptable. We were told the sites were full but yet seven days later not a single pull through vehicle has come into the facility on the sites that we requested. Nor have they answered our request. As result of their failure to meet up to their obligations, to provide a satisfactory service, as was advertised and contracted for we are terminating the contract and demanding an immediate refund for $455.00 returned to the credit card charged, the 11 days remaining on our prepaid site payment. No refunds are not a valid legal claim for fals advertised claims, poor services, site problems and failure to correct when requested. Let me first explain the rationale for canceling of the contract for services due to failure of delivery, quality of service, falsification of available services, and lack to assist a 90% disabled veteran with a verifiable medical condition by relocating their site preferences and secondly by discriminating against my wife who has medically verified multiple sclerosis and was discriminated against by refusing to make any allowances or accommodations whatsoever as result of both of these medical conditions. RV Parked at end of non-level site, extending to road edge as site was not level. Words failed us in providing public reviews of this facility as we were only able to explain the failure to accommodate verifiable illnesses including having sustained bronchitis and being medically treated by local doctor in pigeon Forge. This establishment failed to make any efforts to solve the situation most primarily on our medical condition which by law they were obligated to make some form of accommodation and secondly by the quality of services regardless of what other claims may be made by the owners or third-party interests that are not verifiable. First, this facility has only a small number of pull thrus not accommodating what is advertised, 40 foot pull through, with level enlarged/wide sites. Second, sites would not accommodate the extension of slide outs nor would they accommodate the use of picnic tables provided at the coach entrance because the sites are simply too narrow. We mentioned this and was told that was what they had but they would look into it. Never a response back. You could not open your RV door the site was so small that, as the picture shows, no room. Complained to the management, no response. The lady at the desk stated that she and her husband managed the park but had NO authority to do anything. Thye refused to move us, refund us or respond to us. Third, the conditions were not acceptable nor of the value paid for. Only 2 shower stalls for a park housing over 70 RV sites, multiple full time park renters. 2 showers for well over 140 potential people. Bathrooms were not air conditioned and this week alone temperatures reached over 90 degrees. Deadly for anyone with MS or this Veterans conditions. Below is a screenshot of the temperature in the Men's shower from my smartphone thermometer. We really wanted Mill Creek to be special, and we found the staff to be friendly and helpful. But the facilities were average. The showers/ restrooms had a strong odor while we were there, though one day it seemed better. [There was a lot of rain]. The pool looked hazy, not very inviting. But the main complaint we have is that it seems like there are constantly people hanging around the trolley stop and front of store/office. Our site was very close to the front. Maybe a trolley stop is a public place, maybe people who lived in adjoining residences have privileges to the resort. But we did not find our stay to be relaxing. If it's just a base camp you are looking for, the price is reasonable and trolley service convenient. But if you are looking for peace and quiet, or a camping environment, or amenities, look at other options in the area. Sites are extremely small. Our RV is only 13' long. Neighbor's fire ring was 2' from our bedroom window. Our other neighbor's sewer pipeline was 2' from our picnic table. Bathrooms have push button passcode with tiny numbers required for ANY access. Restrooms adjacent to pool have passcode as well and a sign saying no wet swimsuits - pee in the pool? Bathrooms are not air conditioned and only had an open skylight for ventilation. Once your shower is over, you are sweaty again before you can dress and get out. WIFI was spotty and not dependable. Everything was clean, BUT we have never stayed anywhere with campsites so close together. They are right on top of each other. We stayed at Mill Creek Resort (Monday to Monday) for our 2016 summer family vacation. Our extended family also came during the week and rented the park models. The reservation process and check-in were easy and quick. The ladies that helped me with our reservations and checked us in were very nice and helpful. I explained what our needs were and they put us in the perfect spot for our RV. We own a large Montana fifth wheel (5 slides) and pull it with a Chevy Silverado crew cab long bed truck. There was plenty of room at our site (#65) for both the camper and our truck. Our site was at the top of the hill and had a couple of trees behind the camper that the slides fit in between, a small tree in the front, a small concrete pad, and a picnic table. The water and electrical hookup for the next site was at the edge of our site but was not in our way at all. The resort offers several different recreation options. There is a nice kid’s pool and regular pool, play ground, basketball court, volleyball court, shuffle board and two nice places across the street (which is not a busy road) to play in the creek or have a nice picnic (two picnic tables). It is also a great place for the kids to ride their bikes around the campground. One of the things we loved about the recreation options is that nothing was every really busy. Sometimes we were the only family using the pool, playground, or volleyball court. There is a bathhouse next to the pool that our family used while at the pool. A pass code is required to access the bathhouse which is very nice since there is a trolley stop at the resort and I noticed some locals use this stop. With the pass code (given at check-in with a resort map) required not just anybody can use the bathhouse. The resort also offers a laundry room, club house, and well stocked camp store. While we were there we wanted to have a fire but didn’t have a fire ring at our site. There weren’t any more available so the resort manager went and got his personal fire pit for us to use. He also was very helpful with our other needs during our stay. The location of this RV resort is also a big plus to staying here. We were off of the main strip but not to far and it is located at the Gatlinburg end of Pigeon Forge making it an easy and quick trip to Gatlinburg or to any place in Pigeon Forge. 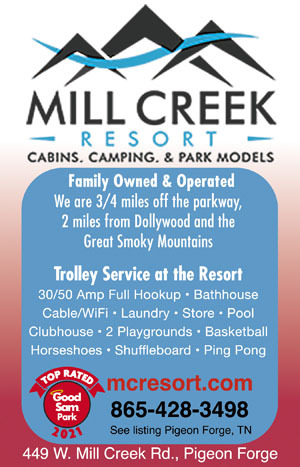 We loved our stay at Mill Creek Resort and will definitely stay here again in the future. We stayed here for 5 nights and what a great campground. The sites were a bit tight for our 40 footer but clean and the owners/workers are all very friendly and helpful. Strategically located near Dollywood and Gatlinburg. 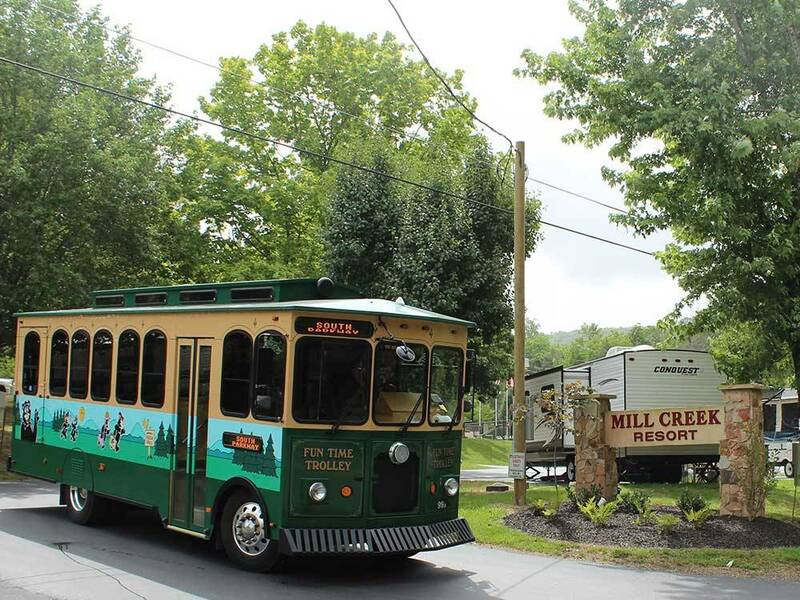 The Trolley stops at the campground but if you are going to DW I would suggest taking your own car. The Trolley makes a number of stops going and coming. Pool was clean and refreshing. Overall nice campground sites were a little tight to get into but we managed. My upset was with my reservation I called in January to make reservations as we were traveling with family and wanted 2 sites next to each other. We arrived with my numbers in hand and were told our reservations had been changed we would not be next to each other. Basically being told "too bad". No offer to try and fix, just that's the way it is, take it or leave it. I was very frustrated,with the customer service as a Good Sam's Park I expected more. We have never been treated this way in any other Rv park, will not return! We had a 42' fifth wheel which required a pull-thru. We got a pull-thru, but the site was so narrow that we had to choose between slide-outs or putting out our awning (we chose the slide-outs!). When we left, had not the site across the street been vacant, we would have had to back out rather than pulled through to get out on the street. The lot was nicely graveled but NOT even close to level and roots from the nearby tree (which prevented use of our awning) made walking from the 5th wheel to our truck precarious. The sewer hookup was ABOVE ground which made dumping difficult (flow). The park appears fairly mature with trees but built on the side of a hill making leveling difficult for camper, water and sewer hookups. The staff were very nice and responsive to an electrical problem on the box. We got very quick response and the 50amp plug replaced. Depending on where you stay, this park is very nice or very marginal. We were very close to the entrance with a newly paved, dead-level, back-in parking pad. Just enough room for the 34' motorhome with our little toad in front. Site was quite narrow with neighbor's sewer connect about 3 feet from our table. Water connection was below ground level and filled with water after a good rain, contaminating my drinking water line when disconnecting to leave. Sites higher in the park are not nearly as nice and parts of it look like an old fashioned trailer park. The shuttle bus to attractions and restaurants in Pigeon Forge is great - especially since the Parkway traffic is terrible. From South city limits at Jct US-441 & Conner Hgts Rd: Go 1/2 mi W on Conner Hgts Rd, then 100 yards N on Mill Creek Rd.